Disaster responses are not always positive experiences for those affected. They can be seen as a separate, if related, event; a secondary hazard following the earthquake, flood, or drought. 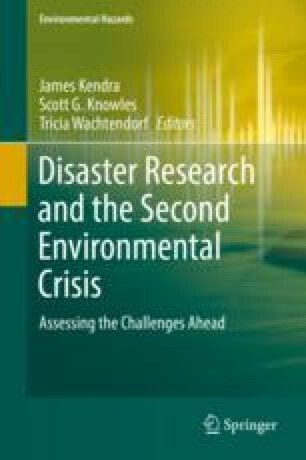 Existing literature argues that different types of disasters can have different effects on community recovery, with natural disasters triggering a therapeutic reaction in communities while technological contamination tends to have a disruptive effect. External response and recovery programs – led by NGOs, by international agencies like the UN, or by the government – can demonstrate the same characteristics described in human-produced disasters, and lead to the same fragmentation of communities. Like technological disasters, responses produce uncertainty: Who controls aid resources, and what is the best way to access them? Where and how will it be permitted to rebuild? What are the long-term consequences of participating in one aid program as opposed to another? When people believe that the government has the responsibility and ability to perfectly execute a robust, seamless response, anything less than that becomes a disaster: something that was done to them. This is complicated by the fact that domestic governments are chary of standard indicators for response successes. Without any way to define a “good” or an “adequate” response (bad responses are usually self-evident), communities fracture over their interpretations of what is lacking and whose fault it is. Responding to disasters is a humanitarian imperative, but where and to what degree that responsibility is held is not self-evident. Governments need to clarify their goals as well as their limitations.